As a Sarawakian studying in Peninsular Malaysia, I've flown a lot over the past six years. But on the flight en route to Kota Kinabalu last week, I heard for the first time something I've previously only heard on films and documentaries--tailwind. We were about to land at the Kota Kinabalu airport at that time--in fact we were already so close to the ground I could see the bodies of individuals walking on the road--when the pilot suddenly pulled the aircraft upwards again. He then announced that we couldn't perform the landing because of the strong tailwind. So what is a tailwind? Why is a tailwind undesirable during landing? According to wikipedia, a tailwind is a wind that blows in the direction of travel of an object, whereas a headwind is a wind that blows opposite to the direction of travel of an object. A tailwind increases the speed of travel and reduces the time needed to reach a destination, and hence a tailwind is favored when an aircraft reaches cruising altitude. 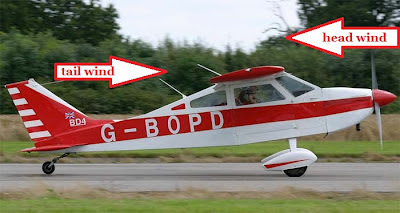 A headwind, however, is favored during takeoff and landing because the aircraft can generate greater lift moving towards a headwind compared to moving through still air, or with a tailwind. And since tailwind increases the speed of travel and unable to generate enough lift for the aircraft, landing with a tailwind can be a rough and dangerous business. Another thing I noticed on the flight is the phosphorescence strips on the cabin floor. Phosphorescence and fluorescence are two difference phenomena. Fluorescence is the emission of photon by a substance that absorbs an incoming photon. When the substance absorbs an incoming photon, the electrons in the lower state is excited to a higher quantum state. Fluorescence occurs when the said electrons fall back to their ground state and emit photons of energy. The emitted radiation usually has longer wavelength than the absorbed radiation. 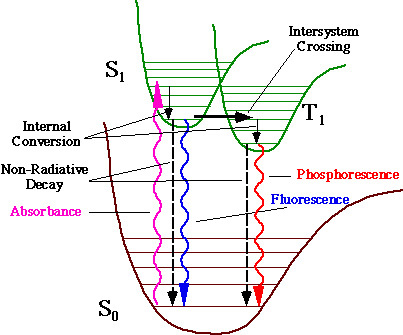 If the emitted radiation happens to have the same wavelength as the absorbed radiation, the emitted radiation would be called "resonance fluorescence". In the special case of phosphorescence, the absorbed photon energy undergoes an unusual intersystem crossing into an energy state of higher spin multiplicity (see term symbol), usually a triplet state. The phosphorescence strips are made from strontium oxide aluminate, and they enable aircraft passengers to navigate the cabin during emergency evacuation.